“Ipagpapatuloy ko pa rin ang suporta ko sa adbokasiya ng KALAHI-CIDSS para naman maipakita ko sa susunod na henerasyon na kaya nating magsama-sama para sa kinabukasan nila. (I’ll just continue to support the advocacy of the KALAHI-CIDSS to show the next generation that we can be united to give them a bright future).” -Renato Carolino from Barangay Villa Boado, Talugtug, Nueva Ecija in his speech during the cycle 2 Criteria Setting Workshop held in Talugtug, Nueva Ecija. Unlike other community volunteers who were accompanied by their colleagues during their presentation of ideal barangay, Renato Carolino from Barangay Villa Boado, Talugtug, Nueva Ecija went on stage with his son Piolo. At a tender age of 14, Piolo innocently held his father’s manila paper as his father started his speech. Listeners can surely feel the conviction in every word of Renato’s speech. It was scorching 2 o’clock in the afternoon at Umali Gym and one would expect the audience to be heavy-eyed or distracted. However, this was not the case when Renato took over the stage. With his public-speaking skills, some may even think of him as an experienced politician, but he is not. He is a community volunteer of the Kapit-Bisig Laban sa Kahirapan – Comprehensive and Integrated Delivery of Social Services (KALAHI-CIDSS) who is willingly giving his time and effort for a sole purpose – to give his child, Piolo, a better future. “Para saan ba ang lahat ng ginagawa nating ito? Simple lang naman—para sa ating mga anak at sa susunod na henerasyon. Para hindi nila maranasan ang paghihirap na dinadanas natin (What is the reason of all these? It’s simple—for our children and the next generation. These are to prevent them from going through all the hardships that we have experienced),” Renato, 48, said in his speech. Renato has been an active community volunteer since 2014. Despite some of his fellow volunteers leaving when their sub-project was not prioritized in the first cycle, Renato still held his unwavering perseverance and continued his quest to give his child the comfort he never had. Piolo, along with all the students from their barangay, walks for an hour to get to school every day. This is why his father proposed an access road as their sub-project. Sadly, their sub-project was not prioritized in the first cycle of project selection. However, with a kind heart, Renato understood why their sub-project wasn’t chosen. “Alam naman naming na mas kailangan ng ibang barangay yung proposed [project] nila (We understand that some barangays have a more urgent need to accomplish their proposed sub-projects),” Renato said. Ms. Elena Villasfer, Barangay Representation Team (BRT) chair of Talabutab Sur shares her experiences in KC-NCDDP during the cycle 2 Criteria Setting Workshop in Gen. Mamerto Natividad, Nueva Ecija. UNSURPASSED COMMITMENT. 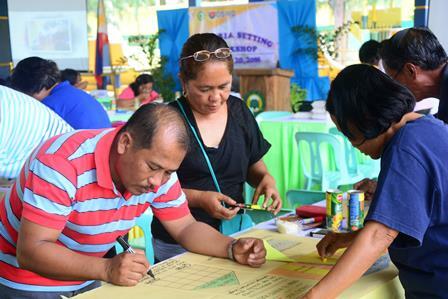 Community volunteers of different barangays in Talugtug, Nueva Ecija actively participate in the cycle 2 Creiteria Setting Workshop (CSW) held on July 19-20, 2016. After hours of intense and participative discussion, the community volunteers in Talugtug, Nueva Ecija came up with this vision of their dream community during the Criteria Setting Workshop (CSW) last July 19 and 20. Lengthy as it may seem, this vision encompasses the solution of all the problems that these citizens have been facing. 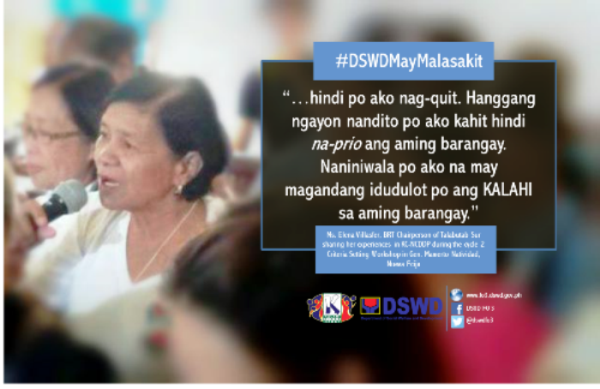 With the help of the KALAHI-CIDSS, a community-empowerment program of the DSWD, the volunteers hope to achieve this vision. “Kailangan, kapag nag-iisip tayo ng vision, hindi lang ang sariling barangay natin ang iniisip natin. Dapat iniisip natin ang kabuuang ikabubuti ng munisipyo (When formulating a vision, we should not solely think about the benefit of our own barangay. Instead, we should consider the welfare of our municipality as a whole),” said the community volunteer from Barangay Mayamot II. After agreeing on a vision, the community volunteers created their own list of criteria for the selection of sub-projects to be prioritized by the KALAHI-CIDSS. In setting criteria, the community volunteers considered various aspects in the community, such as security, health, education, environment, and livelihood. The participants also came up with a creative method on the presentation oftheir barangay’s sub-project proposal. As agreed, the Municipal Inter-Barangay Forum – Participatory Resource Allocation (MIBF-PRA) will be held on October 14 at Umali Gym, Talugtug. Talugtug Municipal Mayor Quintino S. Caspillo Jr. welcomes the community volunteers during the Criteria Setting Workshop on July 19. To ensure full compliance on official procurement procedures, the Regional Program Management Office (RPMO) of the Kapit-Bisig Laban sa Kahirapan–Comprehensive and Integrated Delivery of Social Services (KALAHI-CIDSS) Region 3 held its fourth Regional Fiduciary Workshop (RFW) last July 19-22 in Cabanatuan City, Nueva Ecija. 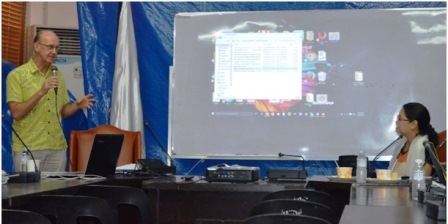 “We need to do this to determine and solve even the smallest loopholes in the procurement process,” said Hyacynth Rivera, regional capability building specialist of the KALAHI-CIDSS Region III. Along with Rivera, the event was participated by Regional Finance Analyst Keisha Morales, Regional Community Infrastructure Specialist Ranel Lombres, finance analysts, area coordinators, community finance facilitators, and administrative officers. The team conducted intense and participative discussions to determine the frequently occurring finance and procurement issues. Moreover, they devised ways on how to address these issues and prevent them from happening in the future. “We should implement strict review standards of the procurement documents. From the documents, signatures, and stamping, we should make sure that all the requirements are complete,” suggested Peejay Morales, FA III. Finance Analyst Keisha Morales also added, “Finance officers must reach out to all community-based finance and procurement personnel and educate them further on due process to prevent issues”.